I recently sat down with Robert Sikoryak, who typically works under the name R. Sikoryak, to discuss his recent project The Unquotable Trump. Building on the artist’s expertise at adapting great works of literature to the comic book format, the collection of retooled iconic covers uses Trump’s bombastic quotes cast against fantastic scenes to satirize the U.S. president and his policies. With this explicitly political project, Sikoryak joins the ranks of other cartoonists who have turned their pen into a weapon against the billionaire reality-TV host-turned-leader of the free world, from Stephen Byrne’s ‘Trump Rally’ to Pia Guerra’s Bannon-Trump ‘Big Boy’ to the feminist anthology ‘Resist’. In many of Sikoryak’s depictions, Trump assumes the role of a super-powered antagonist, such as a winning-obsessed Magneto taking on the ‘Ex-Men’, an apish campaigner chastising ‘The Black Voter’, and a Dr. Doom-like overlord trying to nab some ‘Hombres Fantásticos’ (all of which reprise famous covers from Marvel Comics (The Uncanny X-Men, The Black Panther, and The Fantastic Four, respectively). On other covers, he assumes more banal forms, such as a flesh-eating zombie in ‘The Walking Donald’, a misogynist thug dispatched by Wonder Woman, or a Bluto stand-in bragging to Popeye about his ability to build a ‘wall’. Given the increasingly recognised power of graphic novels and sequential art to reinforce and transform political culture and even impact international relations, I wanted to dig into Sikoryak’s motivations and methods, with an eye towards how such representation reinforces or challenges ideas about Trump in the U.S. and overseas. 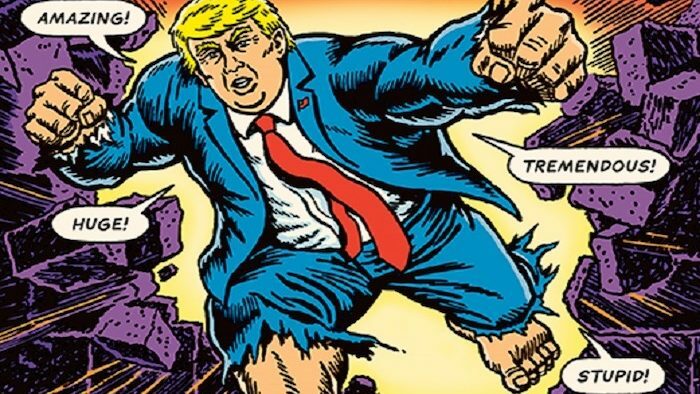 Saunders: Could you discuss when and why you decided to embark on your now-famous project to employ classic comic-book covers to depict Donald Trump’s bid for the U.S.? How did your previous experiences adapting literary classics to comics inform your work?